It’s not every day that you come across an all-in-one garden center, gift shop, and little piece of Zen, that’s owned and operated by a gardener with a background in aerospace engineering. But that’s exactly what you get with Earth, Wind & Flowers and its owner, Susie Stillo. Susie, who has a degree in computer engineering, worked for six years in the aerospace industry before starting a family with her husband, Andy, and ultimately deciding to make a career change. When she and Andy learned that their first-born was actually twin girls, Susie quickly realized that her idea of balancing motherhood and a part-time aerospace career was no longer an option. So as that plan flew out the window, Susie pieced together a bunch of part-time gigs – everything from a paper route to teaching computer classes – to help contribute to her family financially. In her spare time – as scarce as it was – Susie remained steadfastly committed to her garden and her love of nature. She’d pull discarded cuttings and scraps – anything with the roots still attached – from just about anywhere. Then, she’d replant them in her own yard, creating an outdoor oasis that not only made her house feel like home, but also caught the attention of her neighbors. Soon, Susie formed Earth, Wind & Flowers and had a devoted following who regularly commissioned her to help them with their own gardens. Eventually, Susie had enough gardening work that her days were spent digging in the dirt , then making memories with her family during dinner, all before leaving to teach computer classes – dressed in a suit – at night. She kept up this routine until she was eventually able to move on from teaching. As her business continued to grow, Susie and Andy decided to take the logical next step, opening up a storefront – their own little country store in the middle of suburbia As they prepared to do so, Susie received a bit of advice from a neighbor, who encouraged her to write a mission statement. That mission statement – the idea of providing a refuge where people can stop and take a breath – has remained at the core of Earth, Wind & Flowers ever since. Susie and Andy are ardent nature-lovers, and it shows. 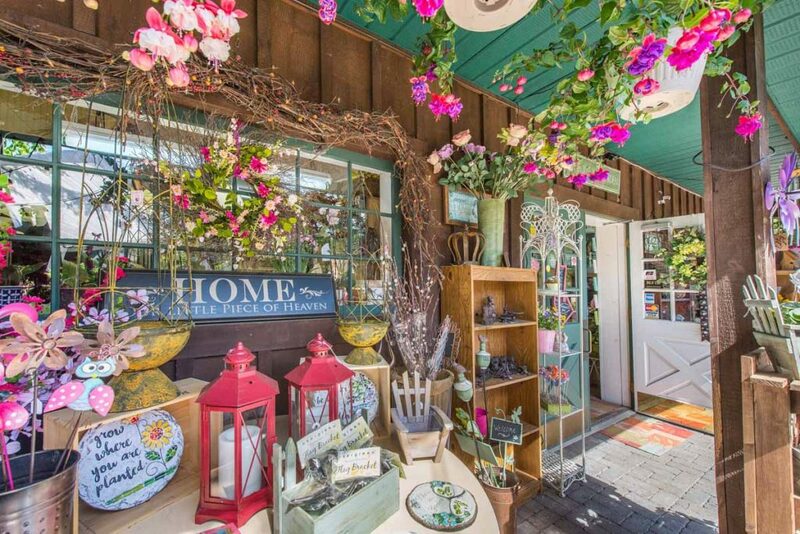 Walk into Earth, Wind & Flowers and you’ll find an array of beautiful and decidedly unique live plant materials and gift items that have all been handpicked by Susie and her staff. With a story as extraordinary as its offerings, Earth, Wind & Flowers is truly unlike any place you’ve ever seen.